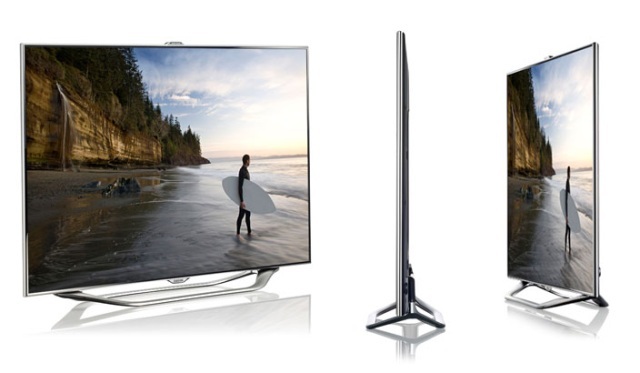 The Looks: The Samsung ES8000 is incredibly thin, stylish and very 2012. Away with the black stands and thick bezels of the 2011 series – everything this year is glass and silver, reminiscent of something in an art gallery. That’s exactly what this TV is, it’s a centrepiece. There’s very little bezel at all, but what’s there, is made up of glass-effect, framing the enormous 55 inch LED display, ensuring that the screen is presented beautifully. 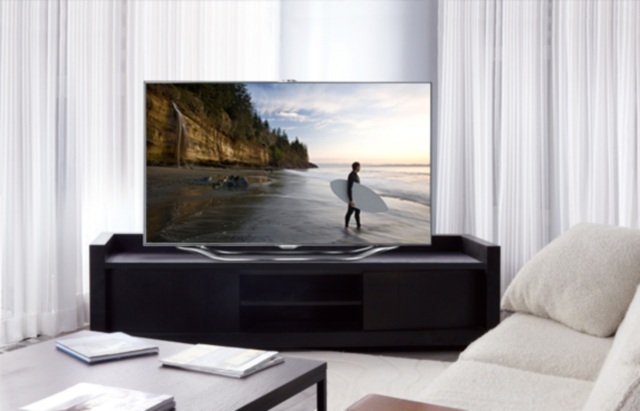 The Features: Being a large TV, you’re not going to want to be sat too close to the screen, but if you are you should make sure you’re watching content in High-Definition. HD video is displayed with such crisp definition. Of course it’s important for any new TV to feature 3D capabilities. Samsung have opted for the active option and the ES8000 comes complete with two sets of active 3D glasses. The 3D image is great, and the glasses provided are actually surprisingly thin and light. Nothing at all like the larger, heavier active glasses we’ve seen in the past with products like Nvidia’s 3D Vision. 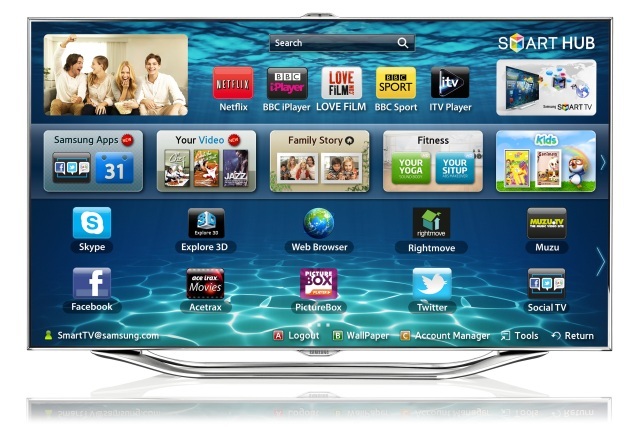 The Smart TV features are where the Samsung 8 Series really shines. The ‘Smart Hub’ is accessible at the click of a dedicated button on the remote. Anyone familiar with iOS or Android will feel right at home here, as the Smart Hub is an app-based system. The pre-installed Apps are fantastic too, with Netflix, BBC iPlayer, LOVEFiLM, BBC Sport and ITV Player being the premium examples. With the exception of Channel 4, that’s pretty much all of your on-demand TV and movies sorted right there. Then there’s the multimedia apps, Facebook, Twitter, Google Talk and even Skype are accessible from the home screen. Updating your social networks, chatting with friends and hosting video calls really couldn’t be easier. The in-built web-camera is high- quality too, so whether you’re chatting to friends and family, or hosting a professional teleconference call, you’re going to look your best. The web browser is basic but fully functional. Comparable to the browsers on PlayStation 3 and Xbox 360 video game consoles. Speaking of games, there’s a whole host of games available in the app store, including the ever popular Angry Birds. And we’re not talking about playing games with an awkward TV remote control, either. These games are fully motion-controlled. That’s right, the in-built camera is not only for video-conferencing. You can wave your hands at the TV in an Xbox 360 Kinect-type manner, to control functions such as volume control and change channels. But the more interesting uses for this tech are in the apps themselves. Playing Angry Birds with your hands is something that’s only just become available on the Xbox 360. There’s also a microphone in the webcam, which can be used for the same purposes. Imagine how simple it is to change channel when you’re feeling lazy or can’t find the remote. Simply saying “Hi TV” launches the voice-commands, which will display on-screen prompts for you to read out, again, much like Microsoft’s Kinect. This is the future, right here. It’s the little touches that really make a difference. While you’re browsing your apps, you can continue to watch television with the Picture-in-Picture mode that is active by default, showing a fairly large screen in the top left hand corner. That works the other way around, too – you can have the webcam open as a small window on the screen while you’re watching TV in the background. Then there’s the fact that you can change the wallpaper of your Smart Hub. All of these touches make a huge difference in making your television more of a multimedia experience. You can of course browse your own video and photo files, too. Be that over the network or on a USB storage device. In fact, the USB options available on this TV are more advanced than anything we’ve seen previously. By plugging a USB drive into the television, you are in fact providing hard disk space for the TV to be used as a full DVR service. So if you’re watching digital freeview channels, you can actually record live-TV as you would with Sky+ or V+. The access to features is never complicated either, there’s not even a need to launch the Smart Hub to browse your USB drive or search for videos over the network – that functionality is all accessible through the Sources menu. 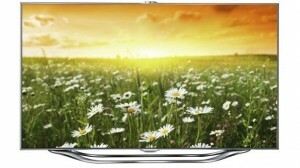 With the Samsung ES8000 there’s really no need for a Sky or Virgin subscription. I’m sure Samsung would never advertise the fact, but with the applications available, the web browser, and the USB/DVR capabilities, you can take care of all your television needs without a cable/satellite tie-in. Full specs are available at Samsung.com. RRP £2,499.99 but available at Amazon for just over £2k. The Samsung ES8000 really is all screen. It’s 55 inches of pure LED goodness. Whether you’re watching television in HD, a film in 3D, or playing a video game, the ES8000 gives you a fantastic sense of immersion. You really feel like you’re in the movie/game. Looks magnificent doesn’t it. But then…for £2500 you’d expect it to be lovely!